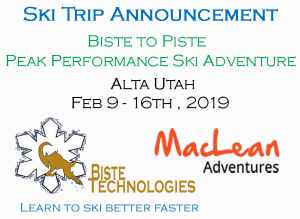 Biste to Piste – Peak Performance Ski Adventure to Alta Utah. Biste and MacLean Adventures have partnered to create a vacation that will be the Greatest Ski Trip of your life! Feb 9-16th, 2019 this 6 Day 7 night trip includes Ski In-Ski Out, All Breakfast and Dinner plus 6 Gourmet On-Piste lunches. Discounts on the Biste indoor training Program in Reno, on Mountain coaching everyday by Kris Buttenberg plus OPTIONAL spa day, airport transfers, The Ikon season pass good at many ski areas including Squaw/Alpine Meadows, June and Mammoth, photography, clothing, etc. Even Better – Guided Mountain Skiing with Hawley and Coach Kris Buttenberg for on-piste coaching/skiing every day. Pre-trip ski training and fitness included as well – the 12 Session Snow Biste package or optional Season Pass upgrade for Snow Biste indoor sessions to get you in shape and ready for the On-Piste snow transitions, fun and the best skiing adventure of your life.